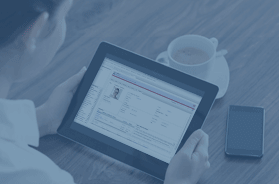 FileFinder Anywhere is the only Cloud Executive Search software that transforms your data. 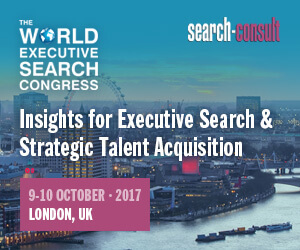 Executive Search Software – only better! Our experience working with thousands of executive recruiters around the World tells us that different users have different needs from executive search software. That’s why we offer two versions of FileFinder Anywhere – FileFinder Anywhere Essentials, the pure browser-based Web app boasting integration with Microsoft Outlook, and FileFinder Anywhere Premium, designed to meet the needs of more demanding firms with all the benefits of Essentials plus an added Desktop app featuring additional functionality such as KPI management and report writing. Allow your team to work on virtually any device – Windows, Apple Mac or Mobile. Work on your search assignments and update your database without leaving your Outlook inbox on PCs, Macs and through a browser. Leverage the power of the web and social media to quickly and easily source information on people and companies far beyond your internally sourced information. Manage your search and business development efforts and monitor performance through an array of KPIs. “Privacy by design” with no local data caches helps ensure GDPR compliancy, while EU/US Privacy Shield helps keep your data transfers legal. Generate superior client reports including the ability to export directly in Word, Excel or share selected information through a Client Portal. 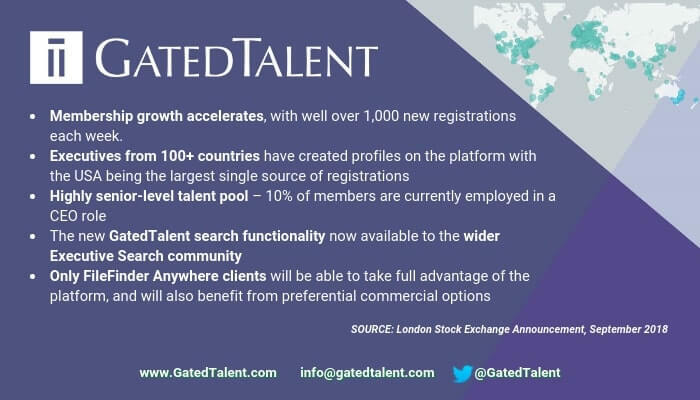 Refresh your data and find new talent worldwide through an exclusive integration with GatedTalent – a platform connecting Executive Talent with Executive Recruiters globally. 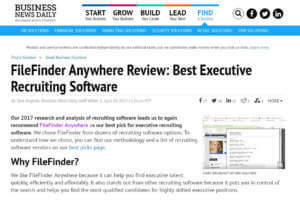 In 2017, Business News Daily has named FileFinder Anywhere “Best Executive Recruiting Software” for the third year running. Our White Papers offer advice to ensure Executive Recruiters are making the most of technology. 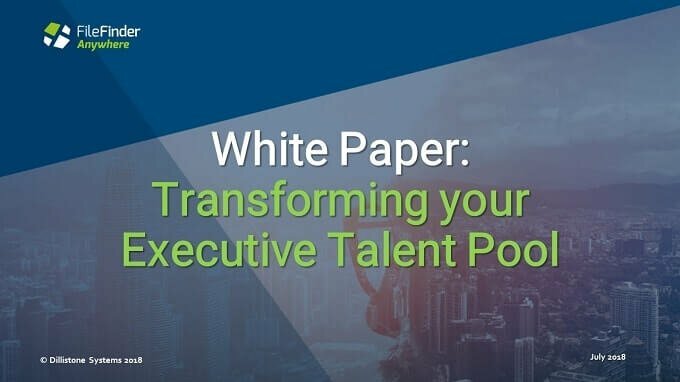 Check out the latest White Paper on Transforming your Executive Talent Pool. Dillistone Systems is the leading global supplier of software systems to Executive Search firms large and small and to in-house Executive Search teams. It is the largest part of Dillistone Group Plc, a public company listed on the AIM Market of the London Stock Exchange. The Group is approximately 40% owned by Management and is consistently profitable. Our commitment to continuously deliver service excellence, combined with our many years of experience, ensures the very best technology solutions for our clients globally. As the leading global supplier of software to the Executive Recruiting community, we’ve spent more than 30 years serving the technology needs of Executive Search firms, in-house recruiting teams and independent researchers. Our clients include independent search professionals and researchers, boutique Executive Search firms, Executive Research firms and industry majors along with Fortune 100 and FTSE 100 Corporations. FileFinder can be implemented in 4 languages and our 5 offices around the world ensure that our clients receive the best possible support in their operational use of executive search software. 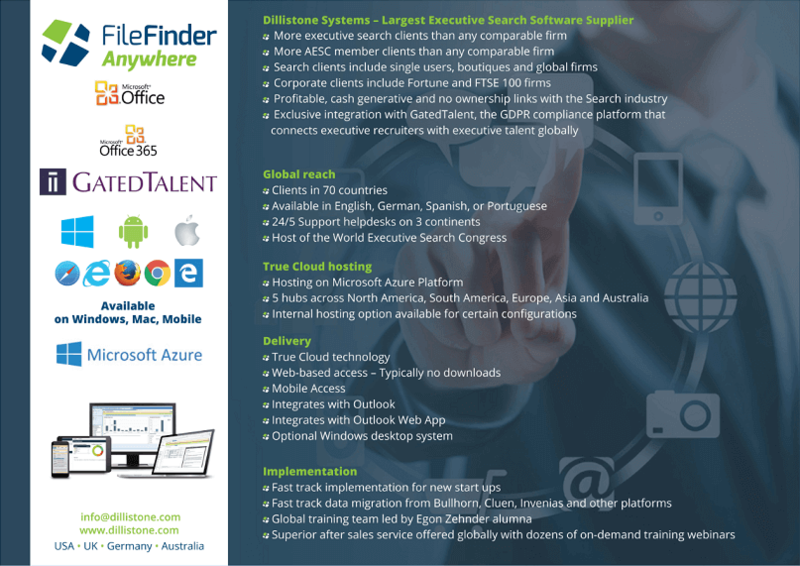 Delivered as an executive search software system or a browser based SaaS solution, hosted internally or in the Cloud, and now with an exclusive integration with GatedTalent – a platform connecting Executive Talent with Executive Recruiters globally, FileFinder is the most flexible executive search system in the market.